I couldn’t even count the number of baby blankets I have made or crocheted over the years. 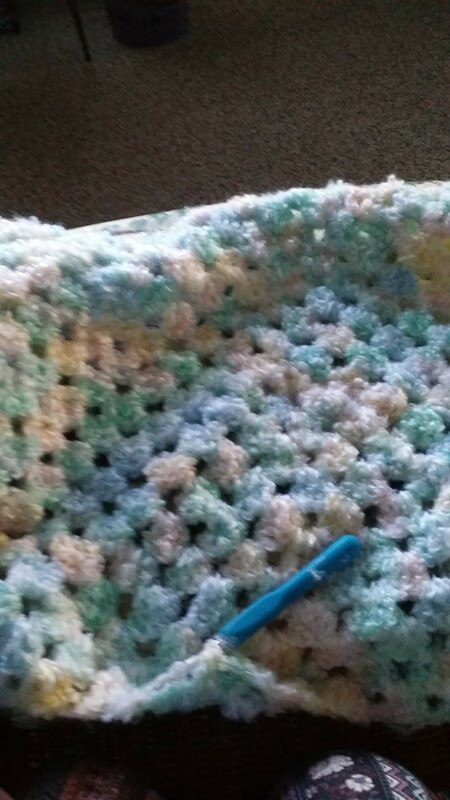 Today as I finished a blanket for my great-granddaughter it wasn’t such a good feeling. Even with the anticipation of this long-awaited blessing from God is the deep sadness that my daughter did not experience this herself. Joy in the midst of pain. She departed to Heaven at 29 years old. She said goodbye to her children not even yet teenagers. Now her daughter married at 21 having a baby leaving me to think, what kind of a grandmother would my daughter have been? What would it be like if she was here? This was not God’s plan for her to be here. Now with a trusting heart I will finish this blanket for her granddaughter. I will trust the one who gives and takes away blessed be the name of the Lord. To all of my sisters who have lost loved ones which seemed like too soon. Take heart Jesus said in this world you will have trouble but I have overcome the world. In Revelation the last sin to be overcome is death. In Genesis there was no death but then sin came into the world. Sin is our problem not death. I pray Lord in the powerful name of Jesus that all of our loved ones will know you and surrender their life to you and trust in your death and Resurrection so we live in eternity together. I pray for all of my sisters suffering those secondary losses of future events missing their loved ones they expected to be with them. I pray that peace will rule their hearts. You keep their Tears in a Bottle . You know their pain. Help us to remember that Our Redeemer Lives and we can put our hope in him alone. He is the God of the living not the Dead. Help us remember that we suffer for a while it will not compare to the glory that lays ahead. I pray in Jesus name amen. Previous: Previous post: OPPOSITION AND THE OVER COMER…. So sorry Gwenn. So much sadness in this world and I am sorry for your continued losses associated with the loss of Jessica (and Faith). Breaks my heart wide open. Thankfully we do have Hope. Blessed assurance.